Kenya is not the first to have this deployment as Rwanda already welcomed this idea and has rolled out the Solar Powered Internet School. 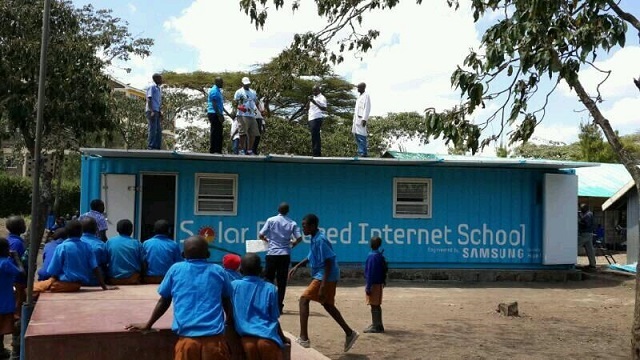 Samsung intends to run this first pilot installation in Kajiado County where the success and impact can be gauged for deployment with other interested partners in the country. The Container is fully powered by Solar Panels making it ideal for locations with limited infrastructure like electricity. It’s set up with a goods container, hence making it secure and if set up at a school will not require a separate building as it comes complete when being shipped. The Internet Schools also have a software that enables the teacher manage the students in way that the teacher can even control what they view on their individual tablets or laptops. This essentially gives them some form of control when teaching. Central storage is enabled, thus the students can do assignments and submit them to a central location for the teacher to go through. By the time the setup was being shipped, Samsung still had the laptops sale in place across the range, but has since dropped sale of low end laptops in favour of tablets. This means that any future installations will come as tablets with keyboard docs instead of laptops. Samsung is working with the government through the Ministry of Education to load the already available content into tablets for ease in consumption by students. But as Samsung Electronics East Africa Vice President Robert Ngeru said in a recent interview, there is no central player that is owning the role of content production. “Nobody is aggressively coming out and saying ‘I will provide the content’, each player is trying out their own things and this poses a situation where there cannot be one single product that can scaled up countrywide”, Said Robert. One of the private schools within the city is already testing the Samsung tablets and loading them with the content they already developed for use in training their students. They have a plan to actively start using the same in the coming semester. Samsung is considering to pre-load content from local developers with the example of My Tichaa app that has kids content, but there is quite a limitation of this as like I noted earlier, the content is from independent vendors that cannot be harmonized with national syllabus. Samsung is looking forward to availing a solution for the early adopters and school institutions that are not tied down to the standard school content roll-out plans to get them going. What’s the name of the school please? The School’s name is Arap Moi Primary School.